Though I haven't read any of the previous titles (but I desperately want to), the excitement was no less. 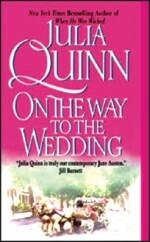 It is not necessary to read the previous ones in order to read 'On the way to the wedding' but it would be considered as an advantage if you have read all the books of the series. It will be easier to understand the relation between the hundred of the characters! 'On the way to the wedding' is the story of Gregory Bridgerton, a twenty-six year old handsome young man. Unlike most men of his acquaintance, Gregory believes in true love. And he is convinced that when he finds the woman of his dreams, he will know in an instant that she is the one. He meets two vibrant young women, Miss Hermione Watson and Lady Lucinda Abernathy. In an instant Gregory falls in love with Hermione. But, she wasn't the one. In fact, she was in love with someone else. But her best friend, Lucy, wants to save Hermione from a disastrous alliance, so she offers to help Gregory win her over, but in the process, Lucy falls in love. With Gregory! Here comes another twist, Lucy is engaged. And her uncle is not inclined to let her back out of betrothal, even once Gregory comes to his senses and realizes that it is Lucy, with her sharp wit and sunny smile, who makes his heart sing, and now, on the way to the wedding, Gregory must risk everything to ensure that when it comes time to kiss the bride, he is the only man standing at the altar…! The story is full of twists and turns. The readers are taken through a roller coaster ride of emotions and just when you think that there might not be any more twists, you'll have another in the very next page! The author, Julia Quinn has done a splendid job. The words are simple and perfectly capable of expressing the emotion. It is a pure love story, and that too a mushy one. It is strongly recommended for people like me, who are really emotional and enjoy love stories! I hope everyone will enjoy the book as much as I have. Each page of the book has something exciting to offer. I got it from a friend who brought it from New York, but I am sure the book is available here. You can search at Etc. or Omni books. It costs USA $ 7.99. I loved it so much that now I plan to read the rest of the books of this series and also the other books by the author. Till the next time I come up with another review of another heart-warming story, Happy Reading!